Terrestrial telescope consisting of fifteen sections. The tubes are made of wood, with the exception of the smallest, made of cardboard. The tube with the largest diameter is covered with green leather with gold tooling, while the others are covered with red marbled paper. The three double plano-convex lenses of the composite eyepiece are contained in a separate tube, which has to be inserted into the smallest section. The largest tube contains the objective lens, not original, of 105 mm in diameter and focal length 8420 mm. The diaphragm securing the objective has the inscription "Ippolito... 1666 fecit". The erased surname cannot be that of Francini, since he died in 1653. 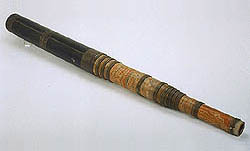 In a Medici inventory of the end of the seventeenth century, the instrument is described as a telescope by Evangelista Torricelli, complete with objective and three double eyepiece lenses, made, like the tube, by Eustachio Divini. It can therefore be said that this instrument was built by Divini around the 1660s and that the original objective was later replaced with a lens by Torricelli. The latter was replaced, in the second half of the eighteenth century, by an objective lens by Jacopo Mariani.